Should Denver Broncos QB Peyton Manning be your first NFL Fantasy Football draft pick? Topps and NFL.com/Fantasy TEAM UP to let you know. Card collecting has been upgraded to a new level by Topps® and these can help you with your fantasy football draft, free agent pickups and managing your team to victory and the championship trophy. Thanks to the 2014 NFL trading cards produced by NFL Enterprises and Topps®, your big data statistics are now easy to find and read on cards you own. Save these as an NFL collector item, trade cards with friends and family, and most importantly, have fun doing it all. “Card collectors are obviously passionate sports fans, so our relationship with Topps helps reach more of this audience and differentiate from our competitors” say Ben Gaedy, Director of Integrated Sales, NFL. The Topps Company, Inc. has integrated NFL.com Fantasy Football insights to help take card collecting to the next level. “Participation in fantasy football is enormous and continues to grow annually so this is a great way to reach new audiences and make sure our product stays relevant amongst NFL fans,” said Marc Stephens, Marketing Manager at Topps. According to the WSJ article – How The NFL Is Marketing Itself To Children, CMO Today had a chat with Mark Waller, NFL Chief Marketing Officer, discussing how they advertise to youth, why they have are aligned with concussion awareness, prevention and treatment, and what fantasy football trading cards bring to students and math classes. How do you want to use fantasy football to market to kids? “We want to make sure that at the younger age, there’s a format for fantasy and a way to play that will allow you to engage. But also use it educationally. It’s a complex game, fantasy. You should be able to learn a lot, particularly around math. How many points do I need? How many points does this player get? We’re also trying to work with groups to get the concept of fantasy based into the curriculum of elementary schools. If you love football and you teach them math through football, the chances are you may teach them better math and more quickly,” said Waller. 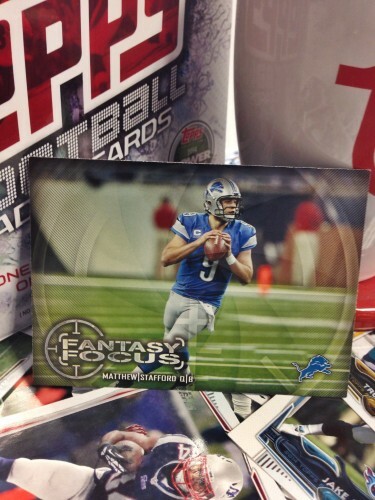 The 2014 Topps Football cards are ready for purchase and soon to trend at your local neighborhood hobby shops, retail stores nationwide and Internet based stores. Founded in 1938, Topps is the leading creator and marketer of sports and related cards, entertainment products, and distinctive confectionery. Topps entertainment products include the NFL, MLB, UFC, MLS, WWE and other trading cards, sticker album collections, and collectible games. The Company’s confectionery brands include Bazooka® bubble gum, Ring Pop®, Push Pop®, Baby Bottle Pop® and Juicy Drop ® Pop lollipops. For additional information, visit Sports Cards and Entertainment Cards at Topps.com and follow us on facebook at facebook.com/Topps, on twitter @Toppscards, and now on Instagram @ToppsSports. 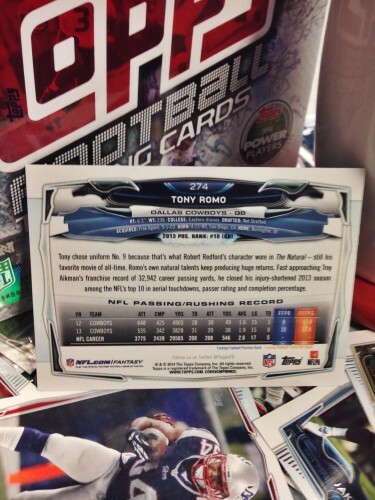 In 2014 Topps ® Football, all 300 base cards featuring the most prominent veterans and the hottest rookies will feature fresh new NFL.com Fantasy Football stats on the backs including Dallas Cowboys QB Tony Romo, who is returning from back surgery. Sport Techie, I have been a fantasy sports nut for at least three decades and have seen it mature into the worldwide business and Industry it is today. Football metrics now mean more to the NFL fan experience than the price you pay to park at live games on Sundays, and TNF, SNF and MNF. 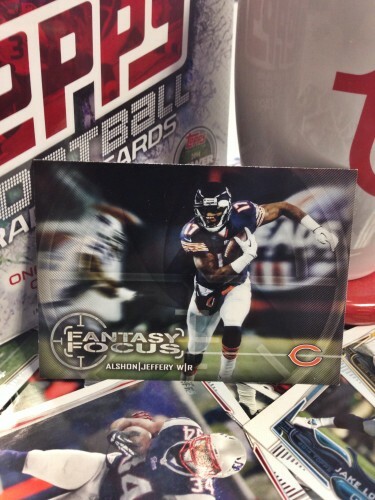 To be able to blog about the introduction of the new Topps® Fantasy Football 2014 NFL Trading Cards is a serious highlight for me and my nearly 15-month old son, who will shortly have a pack to call his own as soon as he is old enough to read and count out loud to ten, which will be any day now. Can the Madden 15 video game on a PlayStation or Xbox console be far behind his favorite Minnesota Vikings Adrian Peterson Topps® card. The defending Super Bowl Champions, Seattle Seahawks, have fantasy football jewels in their top ranked defense and running back, Marshawn Lynch. 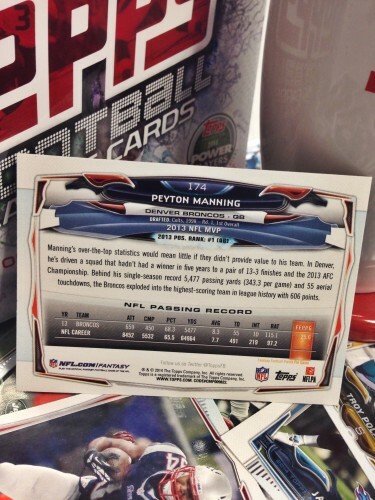 The latter is a worthy first round selection in most draft formats, but they also feature QB Russell Wilson, and often injured WR Percy Harvin, who are easily high-to-middle round picks, but check your new NFL 2014 Topps cards player insights to be sure you have the right kind of data backing you up. Here in Atlanta, the Falcons are looking to have a rebound season and are featured on the HBO Hardknocks show that gives fans a behind-the-scenes look at training camp. I have kept my virtual eye on the return of injured WR Julio Jones, QB Matt Ryan, the NFL’s highest paid athlete, and the RB-by-committee they have in place to try and win games. Will the New York Giants QB Eli Manning return to his draftable fantasy football status or is he a bust, and will his older brother Peyton, set the Denver Broncos offense of fire again by throwing for new fantasy and NFL records. A rookies’ production is always tough to gauge, free agents on new teams can slip by in drafts, and drafting sleepers to go along with bona fide superstars are how most managers win fantasy football drafts. These innovative Topps® Trading Cards provide you with a strategic, competitive edge that will guide you through these tough decisions that NFL General Managers have trouble making. Aging and injured veterans such as Indianapolis Colts WR Reggie Wayne and Falcons’ Roddy White, plus Dallas Cowboys QB Tony Romo, all have something to prove but will they actually do it for their team, city and your fantasy football squad. Breakout candidates such as Chicago Bears WR Alshon Jeffery and Detroit Lions QB Matt Stafford, can both win you close games when they catch over a 100 yards and score two touchdowns, or toss three TD’s and pass for over 300 yards. The question is, where do you draft them, in the first round, or can you afford to let them slip into the second or even third rounds? I love fantasy football and so do you if you are a vet, or so will you if you are a rookie. Women and girls are just as into this as men and boys. If you are overseas, play in an online free league and get your feet wet, you won’t melt and chances are you will be hooked for life. If I was retired, for sure I would play fantasy football, lock into the NFL Sunday Ticket Max on DIRECTV and be ready to rumble on Sunday’s via their sports tech products like their Fantasy Zone Channel and Redzone channels, available on their app for mobile devices such as smartphones and tablets. Be sure to supplement your fantasy football in-season and offseason, especially if you’re a kid, with the new Topps® and NFL trading cards. The Sports Techie franchise on the CBS Sports website drafted New Orleans Saints QB Drew Brees, as the fifth overall pick in a 12-team league. We have owners who live in Washington and Idaho. Our commish set up the scoring to give quarterbacks big points for TD passes and total yards passing, as well as a PPR (points for reception) system for RBs, WRs and TEs. Was this the right pick? I will need to consult with my Topps® card and you all to find out. A special shoutout goes to kickers because when they blast over a fifty yard field goal for three points, plus any bonus points, we love them just like their teammates do.